Can we do something different and better? Something active? The goals are to convey a sense of what research we do, to highlight themes that span a diverse set of faculty research interests, and to keep students awake and engaged (at 2-3pm — near the end of a packed day). Connecting research groups. Each faculty provided two “snippets;” each snippet consists of a figure from a paper along with its caption, the paper title, and author list. We divided students into a few groups, gave each of the groups all the snippets, and instructed them to find commonalities of theme, authors, methods, whatever they can imagine, that link one faculty member to another. 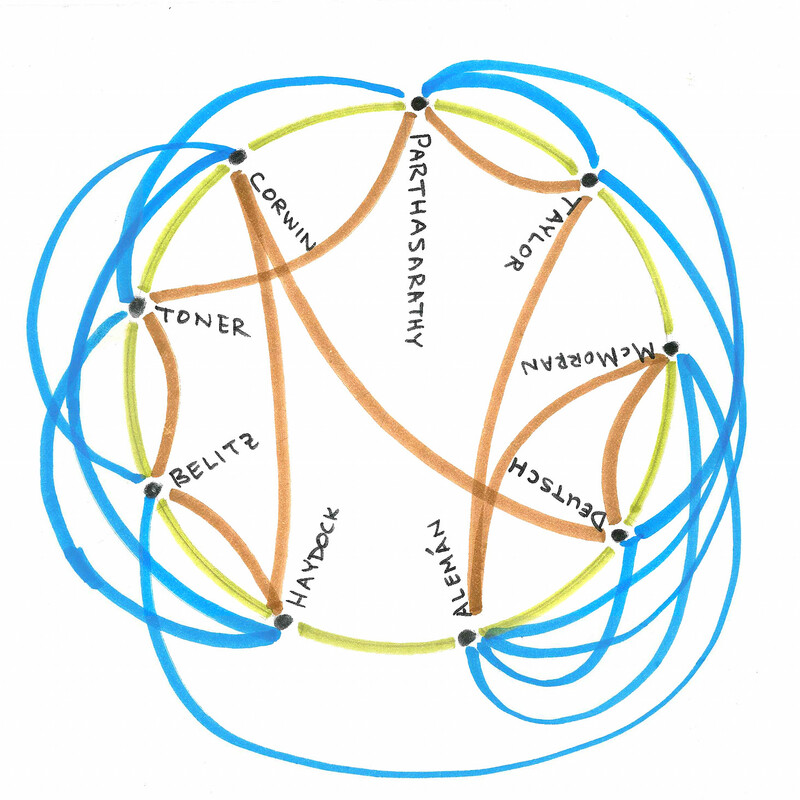 The task was to construct a graph (in the nodes & edges sense) that spans all faculty. Even better: to construct a cyclic graph with two edges per node. This sounds rather abstract, but was remarkably fun. (Two of us tried it out beforehand, discovering its fun-ness.) The exercise lasted about 20 minutes, not counting our discussion of it afterwards, during which students were talking, were engaged, and were clearly poring over the methods and topics illustrated by the snippets to absorb what they were and what they implied about approaches to physics. We (faculty) left them alone for a while, and then chatted with the students to see what they were thinking, answer questions, and offer advice. (They didn’t need much help.) Two of the three group’s graphs are shown above, in the image at the top of this post. 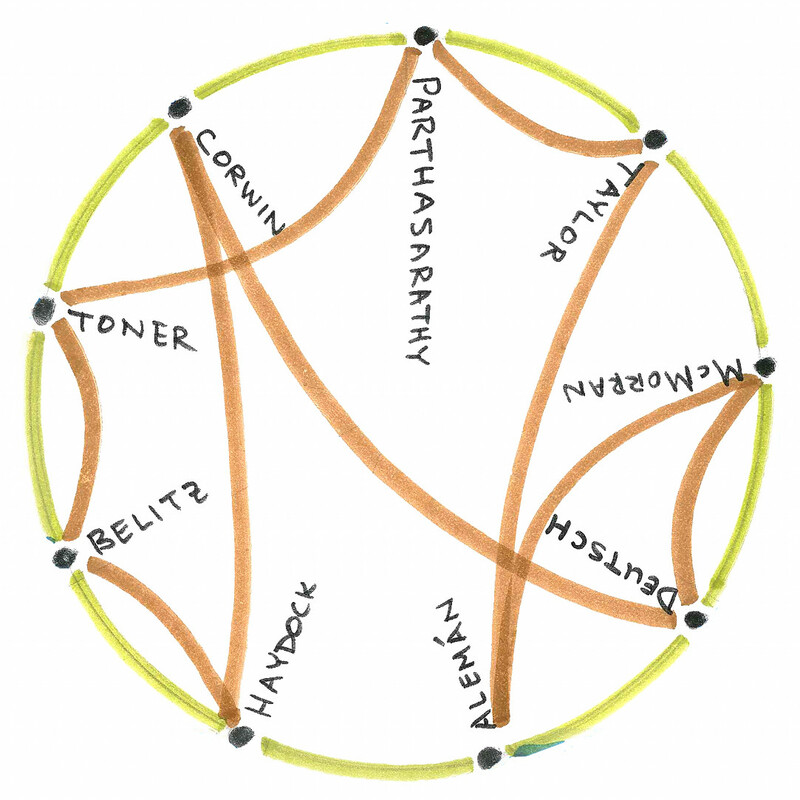 (The green edges are one group’s connections; the brown are the other’s.) The third group’s is included in the image at the bottom of the post; I suggested to them about 5 minutes in that they stick to two edges per faculty, which is why some, but not all, of the nodes are rather prickly. (These images are my own re-copyings of their graphs, which were all done on separate pieces of paper.) We then had the students explain their reasoning, and elaborated on various concepts that arose. It was lively. History. This activity has as its origin a neat paper discussed in our science teaching journal club (http://w.lifescied.org/content/12/4/628.short) on classifying objects (e.g. superheros), the categorization of which illuminates naive vs. deeper understandings of concepts. (I adopted this recently for my Physics of Life class, with the subject of physical mechanisms by which animals avoid sinking in water, but that’s another story.) I thought of an activity in which students, given some information about each of our research interests, construct categories that cover groups. Eric Corwin proposed the graph / connections idea, which is much better, and then he, Ben McMorran, Benjamin Aleman, and I fleshed out its implementation.